The genus Phiomia is the second step in the elephant evolution after Moeritherium. Phiomia lived during late Eocene and early Oligocene (abt 36 million years ago) and has been found in El Fayum in Egypt. Descendants are Deinotherium, Palaeomastodon and later Elephants. 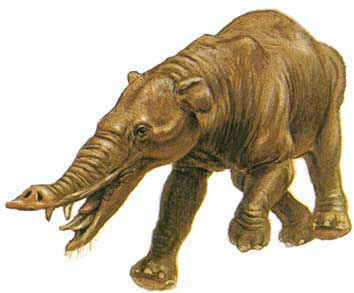 Phiomia had a trunk, tusks in both jaws, was about 1,40-2,40 meter high and lived in swamps, feeding on water plants. Its teeth were typical of all mastodons, consisting of a series of paired conical cusps. Phiomia had no first incisors or canines.